It is Saint Patrick’s Day today. A lot of Irish people must be wearing shamrocks or green clothes and celebrating their national holiday with green foods and drinks around the world. I never knew about St Patrick’s Day until I came to Australia. I guess there is no big Irish community in Korea so I never heard about it back then. Anyways I’m definitely not Irish nor Christian, but wanted to make something green. Green foods don’t really sound appetizing though the first thing comes in my mind is mold? Then green desserts sound better to me. 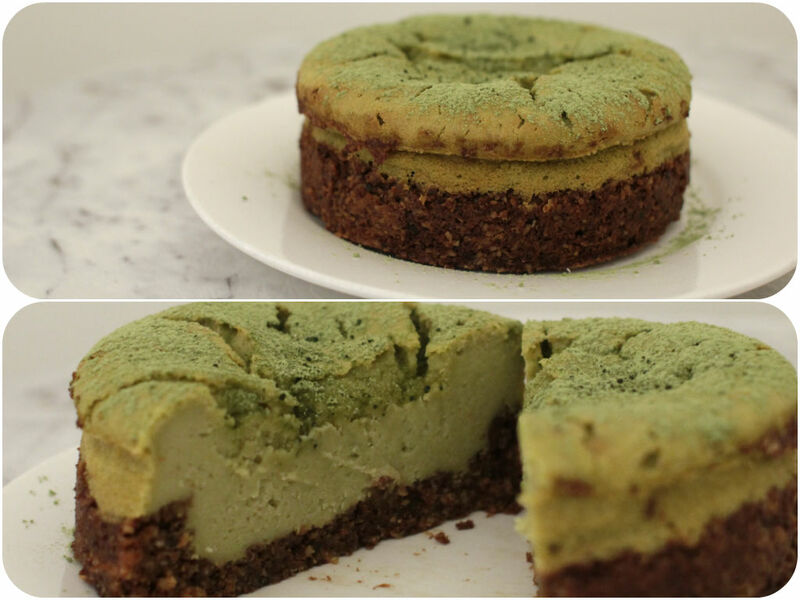 Mint, pistachio, green tea… So I decided to make baked green tea cheesecake. Maybe my oven was a little hot as you can see the cracks on top. Keep an eye on this baby while it’s in the oven so that you don’t get a giant crack like mine or it might get too brown on top. Happy St Patrick’s Day! To make a crust, put all ingredients in a food processor and blend until you get a dough consistency. Add a bit of water if too dry. Pour the mixture into a spring-form tin and press evenly with the back of the spoon. Set in the fridge while making a filling. Gently beat cream cheese, egg, sugar and coconut oil in a mixing bowl. Then add green tea powder, flour, vanilla bean powder and baking powder and combine well with a spatula. Pour the mixture into the prepared crust. Bake in the water bath in the preheated oven (160) for 40-45 minutes until cooked. When the cake is done, take out of the oven and cool down in the tin. Refrigerate to set at least for an hour before serve.